itFits rolled out their latest smartphone accessory which serves as a stand, recliner and hook for almost any phone on the market. The itFits is an accessory with thermoplastic, rubber arms which flex to fit most smartphones, with or without a case. 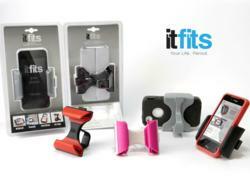 itFits – The smarter smartphone accessory that flexes to fit your smartphone, with or without a case. The patent-pending functionality of itFits allows users to use the product as a stand, recliner or hook and is compatible with the iPhone 3/3G/4/4S/5, iPod Touch, most Android and Blackberry smartphones, and a wide array of leading smartphones available today. For more information on the product or to make a donation in exchange for the new, universal accessory, visit the itFits’ Kickstarter campaign which ends on Wednesday, March 6 at 3:57 PM EST.